Desert patterns of the Mesquite Flat Sand Dunes just before sunset. Playing around with the "Diffuse Glow" filter in Photoshop (Filter => Distort => Diffuse Glow) really gave me the stark, desaturated look I had been hoping for when I took the original image. 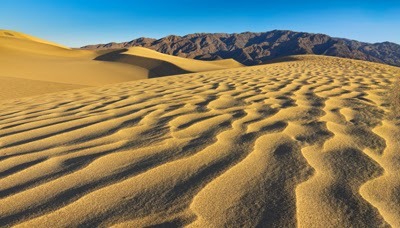 In real life, the sun reflected off of the sand ripples and across the background mountains really giving a harsh desert feel to the environment. The camera captures whatever it can, and then it's a huge process to infuse the image with original feeling of being there on the day. The Diffuse Glow filter option seems to work well when there is sufficient contrast in the image, so I did some work on the Midtone contrast first before using this filter to achieve the results you see here. Original Image for "Desert Dunes"
Hope these ideas help you too! Posted by Laura A Knauth at Sunday, April 13, 2014 No comments so far. Comments Welcome! I wanted to expand on one of the steps in the workflow snapshot of my "Life On The Farm" photo. I've been adding what I call an 'eyeline' layer to all of my recent photo processing and plan to keep using in the future. The layer is designed to add extra support to where I intend the eye to travel over the composition. It's intended to adjust the grouping of objects across the canvas (as opposed to local adjustments to separate nearby objects like blades of grass). It's a subtle effect, but I find the final image has a more 'set' or 'complete' sense about it. The effect is definitely noticeable when toggling the two layers back to back. 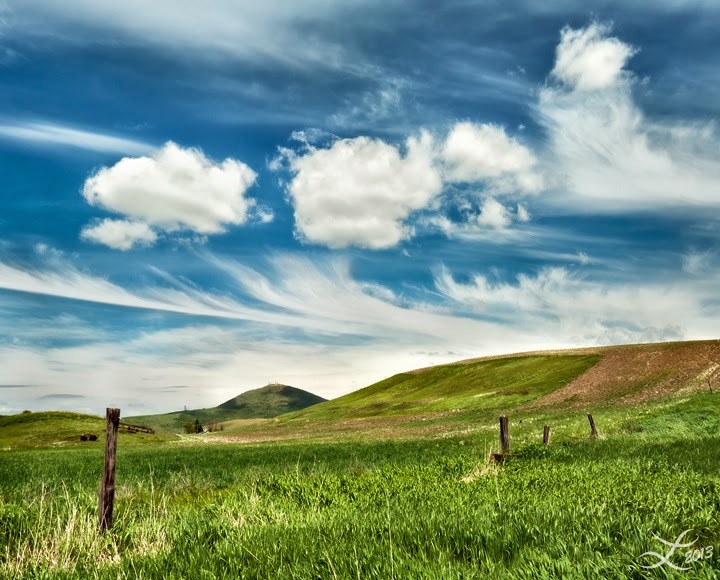 * Add a "Levels Adjustment Layer" in Photoshop (that's the half light, half dark circle icon at the bottom of the layers window; and select "Levels"). * I don't actually touch the levels curve, I've done this entirely so I can subsequently paint on the mask (default is a white rectangle) attached to the layer. * Change the Layer Mode from "Normal" to "Multiply"
This will apply "Multiply" to the entire image which will darken everything initially (notice the increased color saturation as well). * Now for emphasizing the eyeline: Grab the Paintbrush, set the paint color to black, and start painting the path you intend for the eye to follow through your composition. Using the full 100% opacity, this effect will appear rather extreme, but I start here to block in the main concept. From this point, I add secondary darker or lighter areas as supporting 'eyelines', and I back off the layer opacity as needed (for this example, I set the opacity of the Eyeline layer back to 45%). Eyeline Layer Mask for "Life On The Farm"
I've been really enjoying the effect of emphasizing specific areas of the composition using this method, and hope you find this technique useful too! Posted by Laura A Knauth at Saturday, April 12, 2014 No comments so far. Comments Welcome! 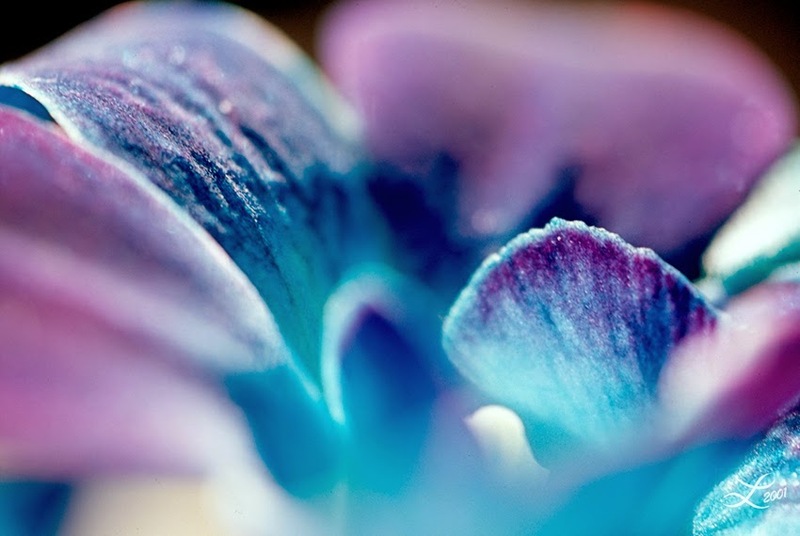 Abstract image of a mysterious blue orchid glistening in the sunlight. Someone did some strange science to the orchids to make them grow this way. Ordinarily, I'm all about appreciating the amazingness that is pure nature, but the colors here were just so striking, I had to take a picture! Posted by Laura A Knauth at Tuesday, April 01, 2014 No comments so far. Comments Welcome! Appreciating green pastures and a little red barn. I relied heavily on the RAW file for this one to recover the detail in the sky (which would have been completely blown out white otherwise). That's just the start for me though these days, as I've been playing quite heavily with some Photoshop darkroom-esque techniques along with some LAB color tweaks. I'm still learning all about what you can do with LAB color, but I'll post the techniques I've had the most success with in a later post. For this image, I spent quite a bit of time working on the midtone contrast, and sorting out groups of nearby tones (evening out local unexpected dark patches after applying adjustments to larger regions like the foreground or the sky). When doing this sort of thing, I've been filtering any black and white specific edits (like midtone contrast, dodging and burning), to dedicated luminosity layers to avoid adding funky colors. For those interested in seeing what kind of steps it took to arrive at this image, I included a snapshot of my Photoshop Layers window down below along with the image out of Adobe Bridge. It's not the most streamlined of flows, but hey, it's what I did. I'm still working to speed up the process so I have more energy to process more pictures! 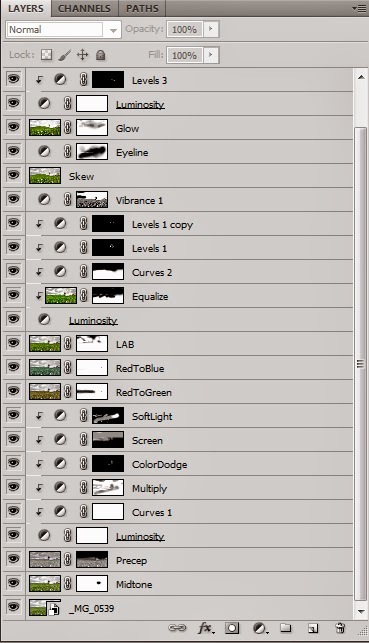 Laura Knauth's Photoshop workflow for "Life On The Farm"
... and these are just the layers left over from what ended up working. The ultimate goal is to have only adjustment layers (the lines that have the down pointing arrows) until the very end so any subsequent tweaks would propagate to the final image. The big break in the middle is where I copied over adjustments made to a copy of the image in LAB mode. Then I realized I wanted to make a few more adjustments and piled on another group of layers for the final product. I've been importing the picture in 'Neutral' mode to remove all camera color processing with the intention of having more color options as a later step in Photoshop (a default camera setting like Landscape mode would have had punchier colors at this point). I always am curious to see people's before and after images. Hope this is a helpful comparison! Posted by Laura A Knauth at Sunday, March 30, 2014 No comments so far. Comments Welcome! This is a quick follow-up post to: Where Does Creativity Come From? As I was watching a movie the other night, I realized there are a few specific techniques I've been incorporating into my life which have helped to spark my creativity, so I thought I mention them here too. I've found this exercise to be a gold mine of creative ideas. Instead of thinking you've wasted your money or your time, you become engaged trying to figure out where you thought the story should have gone, what aspects of the character you thought aught to have been developed, what would have been a worthwhile resolution? I usually have quite a few notes to jot down initially and also after letting these things rumble around for a few days. There are a lot of movies and books out there, and plenty of them don't deliver. It's a map to buried treasure for you. Even the mostly great ones have some aspect to them you might have tweaked in some way if the artist had called you up personally for your opinion, right? So pretty soon, there you have it: a big stash of cool ideas all your own. For writing, I usually need about at least three interwoven compelling ideas to come up with what I think is a strong story: a particular setting interacting with particular characters that are triggered by some compelling scenario. Whenever one of these pieces is missing, I'm grateful for my stash of previously collected ideas. I thumb through my notes and frequently find just what I'd been looking for. This doesn't have to involve just storytelling though, it could be anything. 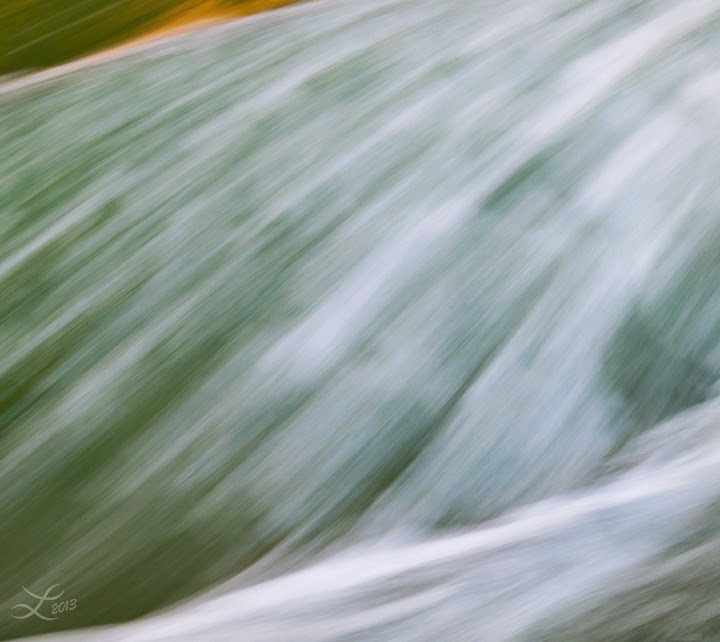 For photography, I go through a similar process for the pictures or paintings I look at. Maybe something about the overall structure grabbed me, but I loose interest when focusing on the details. I still find it worthwhile to identify what worked & separate it from what didn't. And even if I really like the whole picture, I still ask myself: if I was standing right there, how would I have framed it? what would I have tried to do, and is that more or less likely to work? That way instead of potentially being disappointed, you become either inspired or empowered. The goal is to stay actively engaged one way or another. As I go about my day, I've been trying to make a point of noticing some detail about some part of my experience that I hadn't noticed before. I've gone on hundreds of walks through my neighborhood at this point, but whenever I call on myself to pay attention and notice things, something new and unexpected never fails to be right in front of me. Hidden in plain sight. It's kind of like awareness training. This doesn't have to be anything huge, just true & you hadn't noticed it before. It could be a pattern on a manhole cover, new shoots popping up for springtime, a funny little bird chirp, whatever. You don't have to know where it fits in yet. Like kindling, it's all fuel for creativity, somehow, somewhere. If it was going to happen, what would it look like? This is a favorite question I ask myself to kickstart my creativity. You deliberately turn off your inner critic & just suppose that something you didn't think was possible could happen. Then, you try to build upon anything and everything you know to figure out it would work. So instead of spending your energy tearing down an idea, you engage your energy to built it up. It's a fun process and you inevitably end up realizing that with just a few tweaks to the initial premise, it's actually not so far outside the realm of possibilities as you previously thought. The story I'm currently writing started largely because I began speculating about a possible science fiction interpretation of Welsh fairy lore. You never know where these things are going to end up. It's like being a detective, but you're trying to uncover something true without putting too much pressure on yourself. I wonder if this is a process of many science fiction authors of the past, like Jules Verne or HG Wells, let alone actual feats of creative engineering. From Star Trek communicators to smart phones? What if? It's the classic spark for many a creative endeavor. Posted by Laura A Knauth at Friday, March 28, 2014 No comments so far. Comments Welcome! From asking questions, and pursuing the answers. "Knock, and the door will open." What limits your life options, what crushes your spirit is accepting someone else's limiting beliefs as your own. This is the case for external judgments about you personally, or any 'facts' you accept about life in general. A little example: If someone says with certainty: "The Egyptians worshiped cats" and you accept their opinion as truth. You've just limited yourself. Some limitations are subtle, some are more obvious; both can have big consequences. As I've been doing historical research for my novels, one of the most valuable skills I've learned (and realized it applies just about everywhere in my life) is to put a mental "in your opinion" after every declarative statement that crosses my path. It's such freedom! And even for personal matters, this approach applies to critics, bullies, all authority figures alike. Because what if they are wrong? No matter how sure they sound, if you are the one who accepts their incorrect opinion as fact, you are the one who's limited yourself. In my little example, I would digest the statement: "Egyptians worshipped cats" as: Egyptians depicted cats in their writings. It's someone else's interpretation that this involved "worship". That opinion goes in my mental slush pile. (Symbolically, a big bucket of proposals that are not likely to get any of my 'funding,' so to speak.) I might come to the same conclusion, but maybe not, and certainly not by default. There's just one small example, but it's shocking to realize how much of the history books, news shows, and all manner of 'common knowledge' are just opinions. Adopting opinions as facts ties you to the status quo. It's fine if the status quo is great, but what if it's gone off track? How can you find a creative solution if you are confining yourself to someone else's false opinions? Your mind loves solving problems, but can't do it if it's cluttered with false associations. So, learn the art of mental digestion: separating facts from opinion, and unleash your creativity! ﻿﻿It's not all or nothing. The art of mental digestion is kind of like the process of digesting food. You don't just inject food directly into your veins; even the healthiest food would become toxic if undigested (except apparently for fresh coconut water). Your body transmutes the food molecules from what you ate into something useful to build your cells and discards what it cannot effectively process. The process of mental digestion aught to be the same. Instead, we are raised to memorize every word of text books, injecting the material directly into our minds without filtration, without transmutation. We are strictly graded through school for 100% absorption, as if injecting that content directly into our veins. It's kind of like downloading a program directly from the internet without running a virus scan. Risky! We are in an era where authority figures assure us they've checked everything 'for our safety' and therefore the most rational thing we can do is accept their best known methods. I bought into it for so long, but now disagree. I think each person individually is capable of sorting out the best solution for the most important issues that effect their own lives. Medical, financial, career, world view, whatever it is: No approval needed, no waiting for statistics needed. It's a difficult transition process to look to your essential self for support, not external authority figures, but it has been one of the most freeing experiences of my life. Like a tree that has been bound for years 'for safety' to protect it from the high winds, the trunk has become all spindly; now there is a danger when cutting those bindings that the spindly trunk might fall over. It's a gradual process of learning how to reliably depend on yourself, to responsibly strengthen your core. But you have to start somewhere. Bit by bit, from here, forward. Another example: There are many books I've read while doing historical research that I consider pivotal in shaping my current understanding and helping me frame future novels, but I'm hesitant to share them because I actually disagree with the author's entire premise. ;p What I monumentally appreciate is the authentic data points those books uncovered. Once I extracted those facts from the author's opinions, I found those books to be immensely valuable. But if I recommend the books here as some of my favorites, people would probably assume I agree with every word or even most words which is not the case at all - doh! I suppose it's like finding the particular piece you were missing; it's not the same for everyone. By strengthening your own digestive fire to extract more useful data from a wider range of experiences, your creative impulse, your pattern matching skills have such a wider base of useful material to draw from. I have found it greatly improve my own creativity and perspective. This approach also undercuts elitism and values the perspectives of more people. I say that is good. So, if you're looking to boost your own creativity, I recommend these tips to remove artificial limitations, broaden your scope, and let your inner wondering go to work! Posted by Laura A Knauth at Wednesday, March 26, 2014 No comments so far. Comments Welcome! Though I hardly paid any attention to being specifically a 'female' engineer while I was at school or in the workplace, I realized my perspective on the topic might be helpful to someone, particularly since I never even considered the thought of being an engineer even once until the month before I started college. Maybe (hopefully) the situation has drastically changed by now, but up through high school, I didn't even really know what an engineer was; if someone would have asked me, I would have probably said a train operator. ;p So, how can you know what you want to be when you grow up if it isn't even on your radar? The first class I took where I was the lone female among a classroom full of guys, I quickly realized that if I did the work and showed I wasn't getting any special handouts, the topic of gender in the engineering environment was absolutely a non-issue. I was a bit nervous initially, thinking I might be belittled or bullied or something, but I can't even say I noticed a hint of any negative undercurrent related to me being female at all. Discussions almost always centered around some sort of problem solving with everyone focused on the task at hand. That continued straight through from college, grad school, and into the workplace. I think there was one comment in my 18 or so years in an engineering environment where one person asked me something about my hair after a meeting. (In a nice way, just totally off topic.) It actually threw me for such a loop that I probably paused for several seconds honestly trying to figure out what language he was speaking. ;p I was probably thinking through all the engineering acronyms to figure out what something called H.A.I.R. might be, and what it had to do with our project. Ha, ha. So yeah, while on the job, very rare to be talking to fellow engineers about anything other than engineering, in my experience. The only real effect I noticed about being the lone female in a room full of engineering guys is you stand out more. I suppose that is added pressure. Sometimes it's fun: unexpected people wave hi to you as they pass by & you're pretty sure they are in your class or on your team, but can't place them, so you just wave hi right back (and try to remember more people for next time). On the other hand: I was highly motivated to be as useful & sharp as possible which I think did take a hidden toll, but that was my issue, nothing anyone else did or said. (I was the kind of person who would have thought a 'C' was failure, an indication I was on the wrong track, but most of the guys would probably have interpreted a 'C' as 'average', and continued on with no problem.) I suppose in an age where some extra scholarships were preferentially given to females, I was highly motivated to show that my grades were what got me there, not any special favors. I can honestly say that the worst treatment I ever received as a female in the field of engineering was from a women's support organization: WISE (I think it stood for Women In Science and Engineering). I was usually so busy through college that I didn't even think to join any special groups outside of class, until the last few months before graduating when I'd heard a recommendation to join this women's organization which was offering $500 for being in their program. Since it involved attending a few meetings, writing a few essays, and doing some outreach, I thought: Why Not? So, I completed all their checklists and received a mock $500 check at the final banquet where they touted my academic accomplishments as if they were their own, and then … they of course refused to honor the check, quoting (rather hostilely, I might add) some bureaucratic mumbo jumbo. They were just using me. What a waste of time and human spirit. And I had been banking on that $500 to buy supplies for grad school, too ... sigh. I would not recommend any fake support groups to anyone in college. Just do the work to develop your own character and capabilities, because that's all you need to apply for grad school, or a job, or anything really. Actually, there was one other bad situation at work where a creepy old guy sent me an offensive email; but I replied via email (so it was on record) telling him not to ever contact me again, and that was the end of that. I think there are a few guys from older generation who are honestly bewildered to see a female in engineering, but if they comment at all, it's usually something like: "Golly Gee Willikers, a female in engineering? Never would've thought it." Which is totally benign: amusing actually. It's as if they honestly can't believe their eyes. So, if you're wondering what it's like being a female in the technical field of engineering, I've found that if you just do the work helping to solve problems, the guys are happy to see you. If anything, you're just changing things up a bit to make it interesting. That's my experience anyway (in both electrical and computer science engineering). One caveat is that I always steered away from management positions (which may be a different story); the politics of it just never interested me at all. There might be some lingering machismo good 'ol boys attitude in upper management, but since I have no experience there, so it's not fair to comment. I was always interested in solving technical problems, so kept maneuvering 'sideways' in my career to keep learning new technical skills (probably not to the benefit of $$, but certainly for my soul). It's just what I was drawn to. But in general, if you've never considered engineering as a career option, know that the coursework in college is essentially just an extension of high school. If you can do it there, you will most likely have no extra troubles with it in college. Engineering is basically a big vocabulary lesson; after that, it's common sense and problem solving, as with any career, I suspect. And if you know someone who might be intimidated at the prospect of being a lone female engineer in a room full of guys working on a technical problem, in my experience, it's all about the work and nothing about appearances. As it should be. Go humans! Posted by Laura A Knauth at Monday, March 24, 2014 No comments so far. Comments Welcome!